I love shopping for books at Barnes and Noble because I know they will have the latest best-sellers arranged attractively and conveniently for me. Helpful clerks will gladly check their inventory if I happen to want something I can’t seem to find. At Christmas they usually have someone there to wrap my purchases. Everything is new, bright, shiny and completely organized. And the Starbucks coffee is supurb. I know all the books will someday find a home. The local Half-Price Books store is quite different with cement floors, simple wooden shelves and classical music in the background. The aroma of fresh coffee from Cafe Calypso drifts strongly over and around customers. “Ken, we have an offer for you,” a voice over the loud speaker summons someone who has brought books in to sell. I often wonder why the individual is selling books. Do they need the money? Have they run out of room at home? Or do they just feel the need to recycle? Will these unwanted books find a new home? Sometimes I shop online for used or out-of-print books. It is the next best thing to rummaging around a really good used book store. It seems there are some standard descriptions for reputable companies selling books. Below are some descriptions used by AbeBooks. If I were a book, I think I would be described as OUT-OF-PRINT AND LIGHTLY FOXED. How would you describe yourself as a book? Very Good (VG): Describes a book that shows some small signs of wear – but no tears – on either binding or paper. Any defects should be noted by the seller. Bowed – A condition of the covers or boards of a hard cover book. Bowed covers may turn inward toward the leaves or outward away from the leaves. The condition generally results from a rapid change in the level of moisture in the air and is caused by different rates of expansion or contraction of the paste-down and the outer material covering the board. Chipped – Used to describe where small pieces are missing from the edges of the boards or where fraying has occurred on a dust jacket or the edge of a paperback. Darkening or Fading – When book covers are exposed to light, the color darkens or becomes more intense. See also tape shadow. Ex-library – the book was once owned by, and circulated in, a public library. This book could well be in any of the above general categories but more often than not has been well used. May have library stickers, stamps, or markings. Any former library book must be marked ex-library. Foxed / Foxing– Brown spotting of the paper caused by a chemical reaction, generally found in 19th century books, particularly in steel engravings of the period. Re-jointed – Means the book has been repaired preserving the original covers, including the spine. 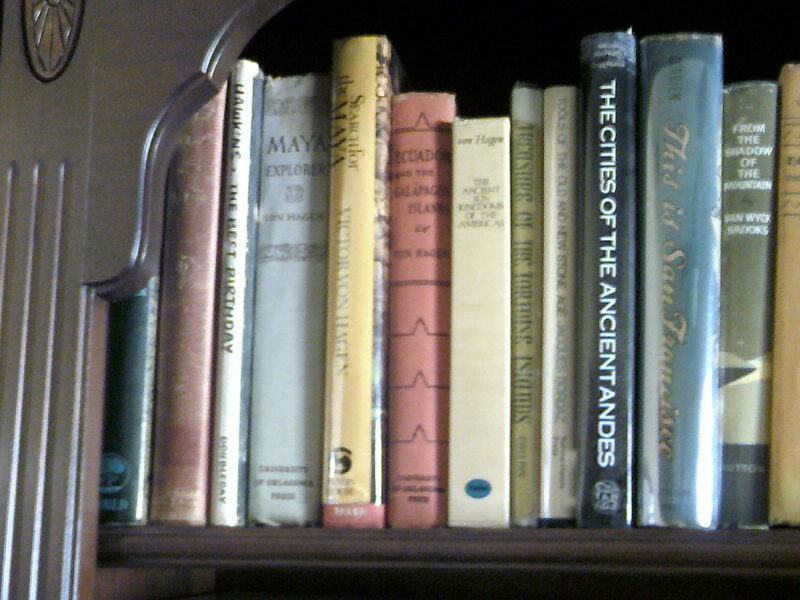 Shelf Wear – The wear that occurs as a book is placed onto and removed from a shelf. It may be to the tail (bottom) edge of the covers as they rub against the shelf, to the dust jacket or exterior of the covers (when no dust jacket is present) as the book rubs against its neighbors, or to the head of the spine which some use to pull the book from the shelf. Working copy – Even more damaged than a reading copy, the working copy will have multiple defects and may even need repair. NEAR FINE: a book approaching FINE (or AS NEW or MINT) but with a couple of very minor defects or faults, which must be noted. Some of my out-of-print books.